Implementation of a TCP/IP server. The following lists the typical server-side scenario in the correct order. Many steps such as setting socket options are optional. The symbol [*] means mandatory. Depending on the platform, some options settings are sensitive to the order. The following order has proven to work on most platforms. Invoking close() is optional since the destructor of the class will properly close the socket if not already done. Here, starting the server means starting to listen to incoming client connections. Internally to the kernel, the incoming connections are queued up to backlog. When the method accept() is invoked and some incoming connections are already queued in the kernel, the oldest one is immediately accepted. Otherwise, accept() blocks until a new incoming connection arrives. [in] backlog Maximum number of incoming connections which allowed to queue in the kernel until the next call to accept(). Note that this value is a minimum queue size. But the kernel may accept more. There is no guarantee that additional incoming connections will be rejected if more than backlog are already queueing. [in,out] report Where to report error. Wait for an incoming client connection. [out] client This object receives the new connection. Upon successful return from accept(), the TCPConnection object is a properly connected TCP session. Once the connection is completed, the TCPConnection objects on the client side and the server side are symmetric and can be used the same way. [out] addr This object receives the socket address of the client. If the server wants to filter client connections based on their IP address, it may use addr for that. Set the Time To Live (TTL) option. [in] ttl The TTL value, ie. the maximum number of "hops" between routers before an IP packet is dropped. Remove the linger time option. Set the linger time option. [in] seconds Number of seconds to wait after shuting down the socket. Set the "keep alive" option. [in] active If true, the socket periodically sends "keep alive" packets when the connection is idle. Set the "no delay" option. [in] active If true, the socket immediately sends outgoing packets. 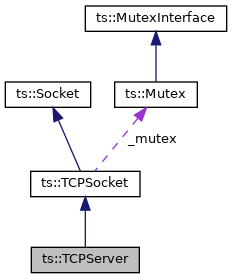 By default, a TCP socket waits a small amount of time after a send() operation to get a chance to group outgoing data from successive send() operations into one single packet. Bind to a local address and port. IPAddress::AnyAddress. Any local interface may be used to connect to a server (client side) or to receive incoming client connections (server side). The IP address of an interface of the local system. Outgoing connections (client side) will be only allowed through this interface. Incoming client connections (server side) will be accepted only when they arrive through the selected interface. SocketAddress::AnyPort. The socket is bound to an arbitrary unused local TCP port. This is the usual configuration for a TCP client. A specific port number. This is the usual configuration for a TCP server. If this TCP port is already bound by another local TCP socket, the bind operation fails, unless the "reuse port" option has already been set. [in] addr Local socket address to bind to. This virtual method can be overriden by subclasses to be notified of open. All subclasses should explicitly invoke their superclass' handlers. This virtual method can be overriden by subclasses to be notified of close. Set an open socket descriptor from a subclass. This method is used by a server to declare that a client socket has just become opened. [in] sock New socket descriptor. Check if socket is open. True if socket is open. Set the send buffer size. [in] size Send buffer size in bytes. Set the receive buffer size. [in] size Receive buffer size in bytes. [in] timeout Receive timeout in milliseconds. If negative, receive timeout is not used. Set the "reuse port" option. [in] reuse_port If true, the socket is allowed to reuse a local UDP port which is already bound. [out] addr Local socket address of the connection. Get the underlying socket device handle (use with care). This method is reserved for low-level operations and should not be used by normal applications. The underlying socket system device handle or file descriptor. Return TS_SOCKET_T_INVALID if the socket is not open.